James Coleman wrote the report that gave rise to mass busing in public schools. But the controversy didn't end there. Disadvantaged black children learn better in well-integrated classrooms. That was the conclusion Hopkins sociologist James S. Coleman reached in the 1966 report Equality of Educational Opportunity--a conclusion that would help set in motion the mass busing of students to achieve racial balance in public schools. The Coleman Report is widely considered the most important education study of the 20th century. It was named after its head researcher, who founded the Johns Hopkins Department of Social Relations in 1959 (today the Department of Sociology). 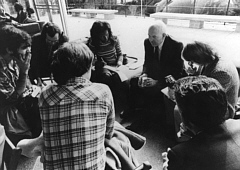 Coleman stayed on the faculty until 1973, during which time he conducted much of his groundbreaking work in the sociology of education, and co-founded, with Edward McDill, the Center for Social Organization of Schools. He died in 1995. Commissioned by the U.S. Office of Education in accordance with the Civil Rights Act of 1964, the Coleman Report appeared at a time of national unrest. The issues of racial relations and equality were foremost in the public's consciousness, and Coleman's study added fuel to the fire. "It was very hectic," recalls Jim McPartland, director of CSOS, who was then a graduate student working with Coleman. "We were facing a stringent deadline because [the report] had a legislative due date. We felt real pressure to get the thing done, that the questions were very fundamental." Using data from over 600,000 students and teachers across the country, the researchers found that academic achievement was less related to the quality of a student's school, and more related to the social composition of the school, the student's sense of control of his environment and future, the verbal skills of teachers, and the student's family background. As a work of sociology, the Coleman Report was full of subtleties and caveats, but the mass media and makers of policy focused on one prediction--that black children who attended integrated schools would have higher test scores if a majority of their classmates were white. That last point is key because in 1975 Coleman concluded in a new study that busing had failed, largely because it had prompted "white flight." As white families fled to suburban schools, the report concluded, the opportunity for achieving racial balance evaporated. His supporters called him a true scientist who changed his opinion when empirical evidence required him to do so. Indeed, Coleman never shied away from the limelight, even when his findings sparked controversy. Aage S�rensen, professor of sociology at Harvard, who was a graduate student under Coleman in the early 1970s, remembers, "Each time he did a new 'report,' and the newspaper quoted him, and half the discipline tried to prove that he was wrong, he loved it. He was very competitive." S�rensen and others describe the former high school football player as "overwhelming"--both physically and intellectually. "He would call you up at all hours and ask you to come to the computer because he had found something," says S�rensen. "He had an enormous amount of energy, and he was extraordinarily smart." Barbara Schneider, a professor of sociology at the University of Chicago, worked with Coleman during the last years of his career there, and describes him as a man who never forgot the human element behind his science. "He felt that the work he was doing was for the good of society. He felt the most important thing was to change people's lives." That desire to have an impact was what originally drew Coleman to sociology. He graduated from Purdue University in 1949 with a degree in chemical engineering, but after working only briefly at Eastman Kodak he realized that he did not want a career in industry. Instead, he wanted a field that combined science with questions of moral importance--a field that addressed issues of people and their social interactions and organization. So he turned to sociology. He earned his graduate degree in sociology from Columbia University and then spent three years on Chicago's faculty before coming to Hopkins in 1959. During his years at Homewood, Coleman was among the first to examine education within a social framework. "There is a whole social context that frames how education works," says Karl Alexander, a Hopkins sociology professor who was Coleman's colleague during the early 1970s, and who now teaches an entire class based on his works. "Coleman, more than anyone else, was at the forefront of directing the importance of the social context of education." Equality of opportunity, for instance, was traditionally taken to mean equality of schools' resources, such as the number and quality of textbooks. Unlike his predecessors, who focused on the equality of what was going into the school system, Coleman evaluated the equality of what was coming out. He also examined student performance, for the first time using test scores as an indicator of equality. In launching CSOS, says McPartland, Coleman intended "to not just use hearsay and testimony but real scientific method to better schools." Coleman returned to Chicago in 1973 and continued his research. The third and final Coleman Report, Public and Private Schools, came out in 1981. In what proved to be yet another controversial study, Coleman found that even after family background factors were controlled, private and Catholic schools provided a better education than public schools. As with his earlier reports, Coleman's bold conclusions shook up basic assumptions about the nature of the American education system. In both academic and public circles, Coleman's findings sparked criticism and debate that continues through the present day. "A whole industry of social science research is trying to better understand and argue with his findings," says McPartland. "We are continuing to see the impact of his work, and we will for many years."